It was a fabulous sunny day for the second in the series of GOGA Grampian’s Tea, Talk and Try Events at Westburn Park in Aberdeen last Sunday. 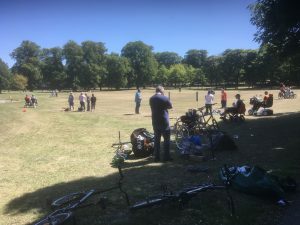 Over 90 people turned out for a fun relaxed time in the park where they had the chance to try adapted cycling, badminton, boccia, bowls, table tennis, tennis and walking and most importantly to gather together for a cuppa and a social chat. 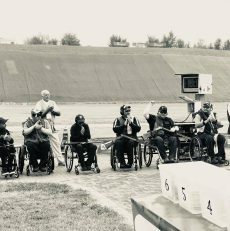 A special shout out to GDS partners supporting the event and to our fantastic volunteers, leaders and helpers, Alex, Brian, Brian, Chris, Dan, Kev, Kath, Kelly, Lesley, Mark, Marna for their fantastic hard work and making the event possible. 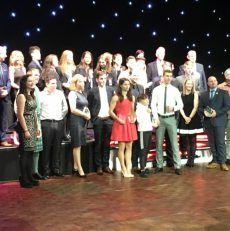 Here are our latest newly trained Cycle leaders!!! Our second Cycle Ride Leader & Led Ride Assistant certificate with Adapted Bikes took place on the 1st July at Newton Dee Village. Huge thanks to Jas and the community for hosting us! 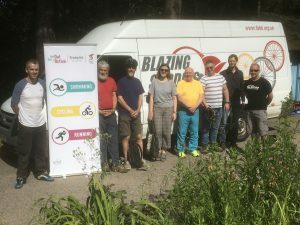 The training was delivered by Cycling Scotland and national partners Blazing Saddles – thanks for great day Allan and David! 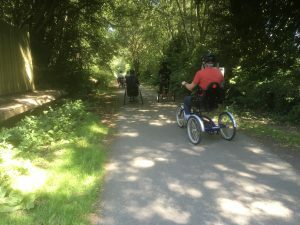 We also had the chance to use the adapted bikes to explore a section of the 41 miles long Deeside way cycle path which was challenging, huge fun and opened up some potential for longer rides in the future. The new leaders will help build our inclusive cycling network and increase the capacity for running pop up cycling sessions in various locations across the region over the summer and beyond. Cycling sessions coming soon!